Order in the next 12 hours 57 minutes and it will ship today! Get helpful tips for your wedding sparkler exit on our blog, The Ultimate Wedding Sparklers Cheat Sheet. We used a small hand-held propane torch to light them. It lights very quickly so that 100+ people can have them burning simultaneously. The best customer service I have experienced in a long time!! Great product, quick shipping! Can't go wrong!! Will be using for my summer wedding! Worked and delivered as advertised. Allow the staff at the venue to control and manage the safety rules, lighting and dousing. We didn't have any issues, however alcohol and pyrotechnics do not mix well. Worked really great. Slow burning and bright. Exactly what your looking for in a wedding sparkler. These sparklers were used at our wedding sendoff instead of rice. They were great and worked perfectly! payment process very easy, items shipped quickly, sparklers came as pictured and described! very happy! Sparkle is not too big, but added length makes these perfect for the send-off as the bride and groom leave the party! I will be using these sparklers for my wedding exit in June. They are a great value and great size. Delivery was very quick. 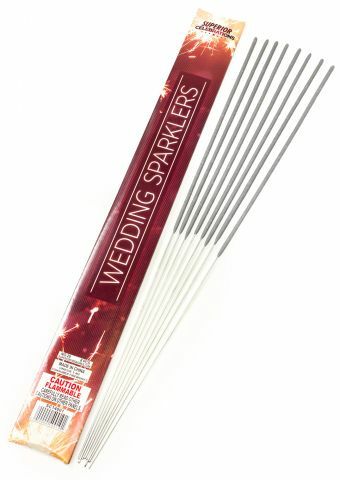 We purchased sparklers for our wedding. Got them fast and packed well. We received the 20"sparklers in the mail quickly and they were such fun at my daughter's wedding. Everyone enjoyed them and the quality was very good! By Mother of the bride From Chesterfield, VA. I was concerned I would not get these in time for my daughters wedding; they were a last minute addition. I called customer service and they assured me I'd get them in time and I did; in fact a day earlier than I had expected them. I will use this company again in the future. The 20" Sparklers were used at a friend's wedding and everyone enjoyed them. They burned long enough for 150 people to light, hold, and for the bride and groom to run through to "get away." Roughly 2 minutes of sparkle! GREAT COST. Really can't go wrong. This company is incredibly professional and timely. Product was ready sooner than estimated. Company contact and customer service is spectacular. GO WITH SUPERIOR! The items were delivered faster than expected and they worked great! Just what I ordered! Just what I ordered! I received my shipment very quickly and they were packed well and very protected. Looking forward to using these at my daughter's wedding! I used these for a nighttime 40th birthday party. They were an excellent activity for adults to feel like kids again. The sparks don't fly as wide as the kind I used to get for 4th of July, which was perfect for a crowded party. They also made for great pictures when everyone whipped out their phones to capture the perfect soft light they produced. And the shipping was fast and efficient out to California. These seemed to be great, though the moment was a bit of a blur at the end of the wedding reception. I'm sure the video will look great.